Operators: Volkov V., Goncharov L., Minaev A., Serov G.
About the Soviet-Cuban space crew, about the flight of the astronaut pilot of the USSR Yuri Romanenko and the research astronaut, citizen of Cuba Arnaldo Tamayo Mendez in the spaceship "Soyuz-38" ["Union-38"]. Soviet space rocket is transported to the launch pad. Night launch rockets into space. Walk in the park Yuri Romanenko and a citizen of the Republic of Cuba Arnaldo Tamayo Méndez. Romanenko and Mendes in the classroom. Crew doubles: astronaut Eugene Khrunov and Cuban pilot Jose Armando Lopez Falcon. Romanenko and Mendes at the desk in the office and in the classroom for the study of special equipment, created for flight. In the hall there is the layout space station "Salyut". Soviet and Cuban cosmonauts go inside, develop, learn to work with the equipment of the station. Romanenko and Mendes in spacesuits take place in the cockpit. Red Square, the astronauts near the Lenin Mausoleum. Romanenko and Mendez escorted from the training center for cosmonauts Georgy Coast, Andrian Nikolayev, Peter Klimuk. Yuri Romanenko says goodbye to his wife and children. Press conference before the flight. Speech commander Yuri Romanenko (synchronous and behind the scenes). Cuban operator with a movie camera. Performs research cosmonaut Arnaldo Tamayo Méndez (synchronous and behind the scenes). A journalist takes notes in a notebook. Space rocket on the launch pad. Operators through the glass wall relieve astronauts. The Cuban delegation, in the center of its leader Raul Castro. Interview with Raul Castro Romanenko and Mendes. At the microphone commander Romanenko and cosmonaut-researcher Mendes report to the Chairman of the State Commission on readiness for flight. View of the harbor from the sea. Bus rides on the street. The Cuban press with photos and articles about the flight of his astronaut. Newsreel 1961 .: first cosmonaut Yuri Gagarin visits Cuba. Pass Gagarin and Fidel Castro by a guard of honor troops of the Republic of Cuba. Directions motorcade through the water, zalivshey streets of Havana after tropical rain. Posters with a portrait of Gagarin. Enthusiastic reception Cubans Soviet cosmonaut. Yuri Gagarin, Fidel Castro and Osvaldo Dorticos at a Soviet-Cuban friendship. PNRM. the crowd in the square (upper point). Fidel Castro on the podium raised hand welcomes people. Gagarin waving to the crowd in the square. Gagarin hang on chest Cuban Order. Romanenko, Y. - Soviet cosmonaut, twice Hero of the Soviet Union. Khrunov EV - Soviet cosmonaut, Hero of the Soviet Union. GT Coast - Soviet cosmonaut, Hero of the Soviet Union. Nikolaev AG - Soviet cosmonaut, twice Hero of the Soviet Union. Klimuk PI - Soviet cosmonaut, twice Hero of the Soviet Union. Castro RR - Chairman of the State Council, the Council of Ministers and the Supreme Commander of the Armed Forces of Cuba. YA Gagarin - The world's first cosmonaut, Hero of the Soviet Union. Castro FR - The Cuban government, political party leader and revolutionary, Chairman of the State Council, the Council of Ministers. Dorticos OT - Statesman and political figure in Cuba. Photo portrait against a background of flags of the USSR and Cuba: cosmonauts Yuri Romanenko and Arnaldo Tamayo Méndez. Family home Arnaldo Tamayo Méndez watching TV. Time of berthing compartment "Soyuz-38" to the orbital station "Salyut". 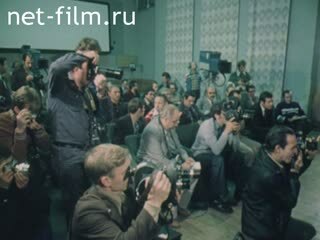 Mendes and Romanenko go to the station, meeting with cosmonauts Leonid Popov and Valery Rumin. Preparation Mendes and Romanenko to fly: the rotation in a centrifuge, the work in the pool under water. Astronaut in a spacesuit is immersed in the pool. Medical research, mastering the vacuum suit "Chibis". Mission Control Center, the screen with a map on the wall. The crew of astronauts aboard the space station. Astronauts say goodbye before leaving Romanenko and Mendes on Earth. Romanenko and Mendes with flowers after landing, the astronauts and meet Cuban sing a song. Astronauts painted chalk on plating lander. The astronauts flying on a plane, go down the ladder, go down the avenue, surrounded by photographers. Romanenko and Mendes hug them takes a group of photographers. Monument Gagarin Square in Moscow. Meeting at the airport, a family of astronauts. Astronauts go down the ladder. Romanenko and Mendes laying flowers at the monument to Gagarin in Star City. View of the Kremlin from the top point. Ceremony in the Kremlin government awards. A group of photographers at work. 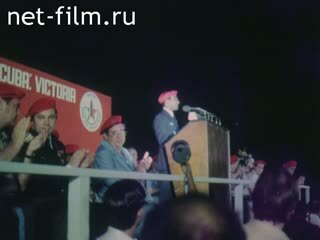 LI Brezhnev, speaking at the microphone (synchronous and behind the scenes). Cosmonaut Vladimir Shatalov, Yuri Romanenko and Arnaldo Tamayo Méndez listening to the General Secretary of the CPSU. LI Brezhnev, Yuri Romanenko awards the second Star of Hero of the Soviet Union, kissing. Cosmonaut at the microphone thanks (synchronous) for the award. LI Brezhnev awards Arnaldo Mendez Star of the Hero of the Soviet Union, kissing. Cuban cosmonaut at the microphone thanks (synchronous) for the award. PNRM. Havana to the top point. Airport decorated with pictures and posters of astronauts. IL-62 is moving on the airfield. Go down the ladder Yuri Romanenko and Arnaldo Tamayo Méndez. Fidel Castro embraces both cosmonauts, as well as a stand-Cuban Jose Armando Lopez Falcon and the head of the Cosmonaut Training Vladimir Shatalov. Occur Cubans with Soviet and Cuban flags in their hands. Astronauts and Fidel Castro guard of honor. Romanenko, Y. - Soviet cosmonaut, twice Hero of the Soviet Union. LI Popov - Soviet cosmonaut, twice Hero of the Soviet Union. VV Rumin - Soviet cosmonaut, Hero of the Soviet Union. LI Brezhnev - Secretary General of the Politburo. Shatalov VA - Soviet cosmonaut, twice Hero of the Soviet Union. Castro FR - The Cuban government, political party leader and revolutionary, Chairman of the State Council and the Council of Ministers of Cuba. Cuban newspaper with the headline in Russian "Welcome!". Directions motorcade with cosmonauts on the streets of Havana. People waving hands and flags. Flags of the Soviet Union and Cuba on street poles. People are standing on balconies and rooftops. Portrait of Yuri Gagarin on the building. Reception in honor of the heroes of the cosmos. Have the microphone stands Raul Castro. Fidel Castro awards medals cosmonauts Heroes of Cuba. Vladimir Shatalov awarded the Order of the Bay of Pigs. Airfield military part of the Cuban troops. Yuri Romanenko and Arnaldo Tamayo Méndez go on the airfield, they are met with applause of men and women in uniform. Pioneers presented with flowers heroes. The exchange of gifts, flags of the USSR and Cuba. Astronauts handshake with the pilots of the military unit. The rally takes place in the evening, people welcome applause Arnaldo Tamayo Méndez, speaking at the podium. View of the earth from an airplane. Rally meeting in the city of Guantanamo countryman astronaut. Mendes embraces his father and mother. Yuri Romanenko hug family members Mendes. Cuban children dressed in costumes of astronauts. Astronauts go on the red carpet, the ranks of the Cuban Pioneers. Girl presented with flowers guests, tied around the neck of pioneer ties. Youth Ensemble performs a dance in the style of samba. View from airplane clouds above the ground. Yuri Romanenko and Arnaldo Tamayo Méndez during preparation for flight, in Red Square on the background of the Mausoleum, among Cuban children go together with Fidel Castro, during trips and meetings in Cuba, take bread and salt from the girl in Russian folk costume, go with bouquets of flowers. 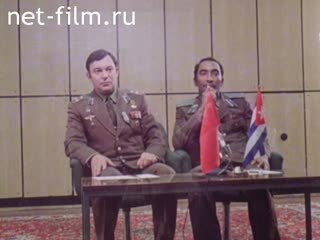 Castro RR - Chairman of the State Council, the Council of Ministers and the Supreme Commander of the Armed Forces of Cuba. Castro FR - The Cuban government, political party leader and revolutionary, Chairman of the State Council and the Council of Ministers of Cuba. Romanenko, Y. - Soviet cosmonaut, twice Hero of the Soviet Union. Shatalov VA - Soviet cosmonaut, twice Hero of the Soviet Union.